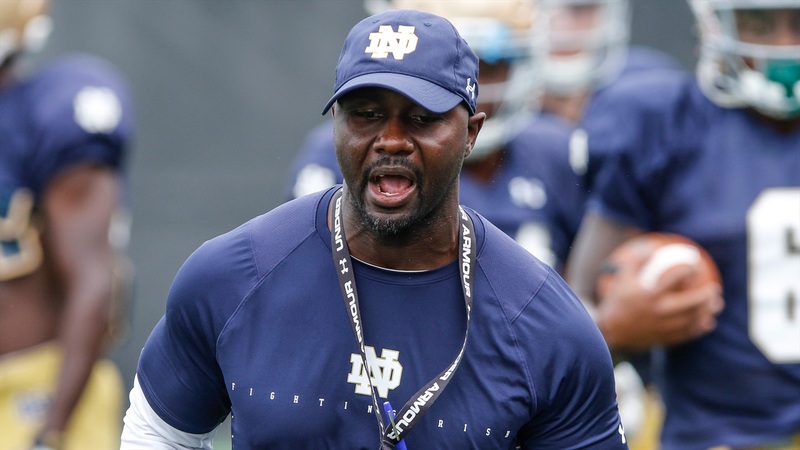 Notre Dame running backs coach Autry Denson will become the next head football coach at Charleston Southern as the university announced it on Monday afternoon. Denson will become the fifth head coach in program history. Charleston Southern will hold a press conference on Wednesday at 10:00 a.m. to introduce Denson. "This is a great day for Buccaneer football," CSU Athletic Director Jeff Barber said. "Autry Denson is a special person in many ways and stands out as both a recruiter and a coach. More importantly, he cares about his players as people first and will, therefore, have great influence on their hearts and lives and will develop each of them into outstanding young men." Denson stayed true to himself as relied on his faith to make the final decision. "First and foremost, I would like to thank God because this is His plan being played out on His timing," Denson commented. "My family and I have always trusted God for promotion. I want to thank Dr. Costin for his vote of confidence and support, as well as our athletic director Jeff Barber. “I was drawn to Charleston Southern by the vision of this great Christian university of integrating faith in learning, leading, and serving. As a result, I knew this could be a place where I could build and lead a program to honor Christ by operating with character, integrity, transparency, accountability, and community." Notre Dame head coach Brian Kelly also wished Denson well as he embarks on his new role. Denson started his coaching career as the head coach at Pope John Paul II (Fla.) before heading to Bethune-Cookman in 2011 to become the running backs coach. In 2014, Denson spent a year at Miami (OH) before taking the running backs coach job at Notre Dame in 2015. Notre Dame’s running backs produced under Denson and it started with CJ Prosise rushing for 1,029 yards and 11 touchdowns in 2015. Josh Adams was the workhorse during Denson’s tenure as he rushed for 3,201 yards and 20 touchdowns in three seasons. In 2018, Dexter Williams rushed for 995 yards and 12 scores. The Florida native played at Notre Dame from 1995-1998 where he rushed for 4,318 yards and 43 touchdowns as he became the programs leading rusher before a short stint in the NFL. Denson will step in for Mark Tucker, who resigned in December. Tucker was 11-11 in two seasons at Charleston Southern. Notre Dame will start a search for a running backs coach and Jamie Uyeyama has put together a list of potential candidates.